Even if you’re not overly health-conscious, you know that certain things are toxic. You’re well aware that fumes from cars and machinery are bad for your health, you know that taking a big ol’ drag on a cigarette is possibly going to give you lung cancer, and you might even make a point of avoiding BPA-laden plastics in an attempt to keep your hormones in check. But the vast majority of Americans have no real concept of just how toxic most fruits and vegetables really are. And unless you’re buying only organic produce, those toxins are building up inside your body every single time you eat. In a Swedish experiment posted on Youtube a few years back, a family who ate only non-organic produce was tested for a range of pesticides in their urine. They were found to have a toxic concoction of several different insecticidal and plant growth chemicals in their bodies — and these toxic chemicals were just as prevalent in the children as in the adults. The good news is that after just two weeks of going organic, pesticide residues in the family’s urine dropped to almost zero for all tested compounds. While the results of this small experiment show just how important it is to go organic where possible, the study authors noted that it will be a long time before we know the full health implications of consuming so many pesticides in our fruit and veggies. Still lacking the motivation to spend a few more bucks at the supermarket in exchange for your family’s good health? Here are more reasons why pesticides are seriously bad news. Think that nice green broccoli or juicy red strawberry is doing you a world of good? Think again! Research shows that toxic residues from pesticide applications during the growing period remain on many fruit and vegetables even after they make it to supermarket shelves. These pesticide residues have been shown to potentially lead to cancer in humans. Commonly used phenoxy acid herbicides, for example, have been linked to cancers of the lung and breast, while many insecticides and organophosphorus compounds have been shown to increase risk of lymphoma, leukemia, and ovarian cancer. Expect to find residues from these cancer-causing pesticides on most of the fresh produce you bring home from the supermarket. And glyphosate, more commonly known as Roundup, has been deemed a “probable” cancer-causing substance by the World Health Organization — this will almost certainly become a “definite” the more we find out about glyphosate and the toxic effects it has not only on the human body, but the environment in general. And residues of glyphosate, which is the most prolifically used pesticide worldwide, have even been found in human breast milk… your baby is being fed poison! Researchers theorized that pesticides harm the brain and central nervous system via an acute toxicity effect, thereby contributing to neurodegenerative disorders like Parkinson’s disease. While the nastiness of non-organic produce can’t be ignored, most people aren’t able to go completely organic. For most, the additional cost can be a major limiting factor, however, it’s often difficult to find a supermarket or green grocer who is actually able to offer an acceptably broad range of organic produce in the first place. Luckily, there’s several easy things you can do with common household ingredients to effectively remove most of the pesticides from your produce. 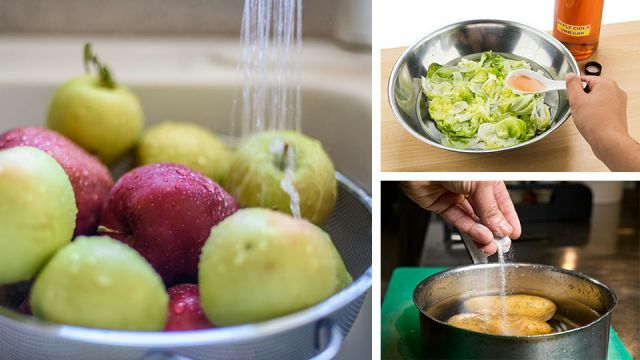 It’s good to know that simply giving your fruit and vegetables a good scrub under a running faucet can go a long way towards removing the majority of pesticides residues. In fact, the Center for Science and Environment (CSE) estimates that between 75 and 80 percent of pesticide residues are removed by a good cold water rinse and scrub. To really ensure you’re getting rid of all those pesticides, make sure you rinse the entire area of the produce in question, paying particular attention to crevices and hard-to-reach spots. If washing vegetables like potatoes or carrots, consider using a scrubbing brush to remove any dirty deposits that could contain pesticide residues. CSE notes that fruits like grapes, apples, plums and peaches require two to three washings to combat most pesticides, as do fruity vegetables like tomatoes. This anti-pesticide method is a personal favorite of mine, as I’m constantly making vinegar as a by-product of apple cider. I simply fill a bowl with cold water, add in a tablespoon of apple cider vinegar (any form of vinegar works just as well), and soak my fruits and vegetables in the vinegar water for at least 20 minutes, preferably half an hour. Then, just give your produce a quick rinse in cold water to remove the vinegar and any remaining pesticide residues, and you’re good to go! If you’re short on vinegar, here’s one you’re bound to have lying around: salt! Simply use the same approach as the vinegar soak, mixing two teaspoons of salt into four cups of warm water. Plop in the produce, find a way to keep it below the waterline, and leave to soak for at least 30 minutes. Rinse under cold water afterwards, and you’re good to go. When you’re pushed for time or away from home, this easy anti-pesticide spray is almost as good as a vinegar or salt soak. In a spray bottle (preferably glass), mix together a tablespoon of lemon juice, two tablespoons of vinegar, and a cup of water. Give the mixture a good shake, then spray directly onto your produce before eating — making sure to cover the entire surface. Before digging in, be sure to rinse off the spray under a faucet — taking the pesticide residues with it. Hey Buddy!, I found this information for you: "4 Easy Tricks To Remove Pesticides From Your Produce, Naturally". Here is the website link: https://www.thealternativedaily.com/4-ways-to-remove-pesticides-naturally/. Thank you.